In my travels, I have lived places where I am the majority and other places where I am the minority based on race/ethnicity. It’s been great and I have loved meeting people from all over the world, seeing blended families through the military life as well as the locals in our various locations. I have noticed a few things lately though….. I have met some interesting individuals….many families who have some out of the ordinary situations in their home….transgender or “gay” children (if that can be determined at 4), lots of homeschooling families with various non-traditional practices, and one family in particular who has taken on the Japanese culture to the 9th degree….they homeschool in Japanese, go to a Japanese church, only watch Japanese television, sleep on Japanese futons for beds, take the Japanese drumming lessons and get this….no one is Japanese nor do they live in Japan. Unique? Yes, very unique and I’m completely fascinated by all these people. But one thing I have noticed, these people are all white!…meaning Caucasian/European descent, American born, English-speaking people. I have never met a non-white person that has a transgender child, a blog about their 4 year old gay child or one that takes on a completely different language or culture. So it made me dig deeper on all the people I know, have met over the years and whose blogs I follow on various unique situations like these and I’ve noticed all the same….white people! So I came to a little conclusion just based on my limited observation….is it that non-white people just don’t happen to have these situations or interests, or are they not so open about sharing them or do they not feel the need for this expressed diversity? Hmmm? Is it that white people feel they need a stake in the land of what our culture deems diverse? 1. Do White (Caucasion/European descent) families who are English-speaking, American born and convervative get a bad wrap…they are often deemed narrow-minded, intolerant and prejudice in our culture….just for being who they are. 2. Do you have to have someone with brown skin, speak a foreign language, be gay or have someone gay in your immediate family to be considered open or diverse? Can you be an all Caucasion family, born in the great USA, speak English only, have conservative views and be “diverse”? 3. I look at my children and someone who sees them may not know the story of all that went into making them….the Native American, the Mexican, the French, the Croatian and Ukranian. If they look “white”, would people have a pre-conceived notion on their “diversity” or lack thereof? 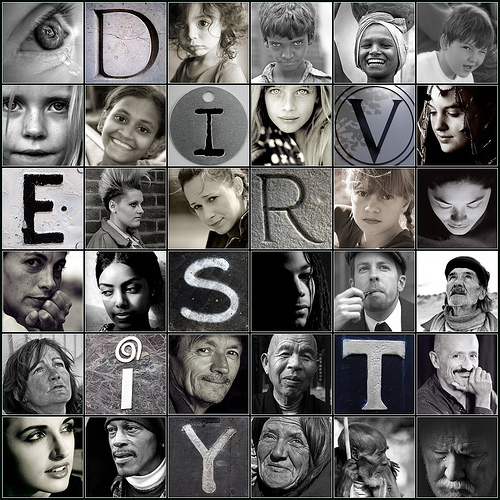 Isn’t diversity about how we fit into the big picture and our our part can make it better. Why does our piece have to look like anyone else’s? But isn’t it okay if it does….all white, all black, all any one thing or not. I once heard an instructor say “I don’t need each student to be diverse, be jack of all trades or a master of all subjects….I need each student to be an expert in their field of study and that’s when the class is great”. I’d be interested to hear thoughts and perspective!